Latex foam is a popular mattress material with a luxurious texture that is known for its soft feel and bounce. Latex is the naturally occurring byproduct of rubber trees; the sap from the rubber tree has a milky texture and is harvested in a way that is reminiscent of maple syrup. What many latex foam mattress shoppers may not know is that there are two leading ways to develop this raw material into a durable mattress. Dunlop and Talalay are two manufacturing techniques that produce mattresses with different feels, although they both work with natural latex. Here is more information on the Dunlop and Talalay processes. The first step in the Dunlop and Talalay manufacturing process is the same: the latex is collected in its natural liquid state, and other materials are added to ensure the end-product foam is of the highest quality. Both methods utilize a mattress mold, into which the liquid is poured. Additionally, both techniques require what is known as vulcanization — although it sounds like something out of a sci-fi novel, this process is actually the appropriate term for essentially baking the latex or other rubber materials into a usable end product. While the beginning of each manufacturing process is the same, Dunlop and Talalay manufacturing diverge after the latex is poured into a mold. In the Dunlop process, which has been in use since 1929, a mold is filled with latex. This latex is frothy and far from its original milky texture. Once placed into the mold, it is tightly sealed and sent into a vulcanization oven, where it is processed using steam heat. Once the product is sufficiently cooked, the mattress is popped out of the mold and thoroughly cleaned to eliminate excessive byproducts. The washing is an integral step to ensure the final mattress product is able to maintain its elastic feel. Once the mattress is washed, high temperatures are applied to it to remove any remaining moisture which can potentially damage the final mattress if left within it. Similar to the Dunlop process, the latex is poured into a mold — but only partially in the Talalay method. Once the mold’s lid is tightly sealed, the liquid latex is then forcefully expanded using a vacuum. Then, the mattress within the mold is frozen and carbon dioxide is piped into the mold, causing the latex to transform from a liquid to a gel. Once the latex is in a gel state, it undergoes the vulcanization process. After being baked, the mattress is washed and thoroughly dried. Dunlop manufactured mattresses are more bottom heavy than Talalay manufactured mattresses; this is because the materials within the mold migrate to the bottom, creating a very firm base. A Dunlop mattress will be notable for its firm base, making it heavier than a Talalay mattress and, some would argue, more durable in the long-run. However, it’s important to keep in mind that either manufacturing process has the capability to make a mattress that is either soft or firm, springy or bouncy, dense or sparse. A variety of techniques during the manufacturing process will enable the manufacturer to make a mattress that suits a variety of customer needs. 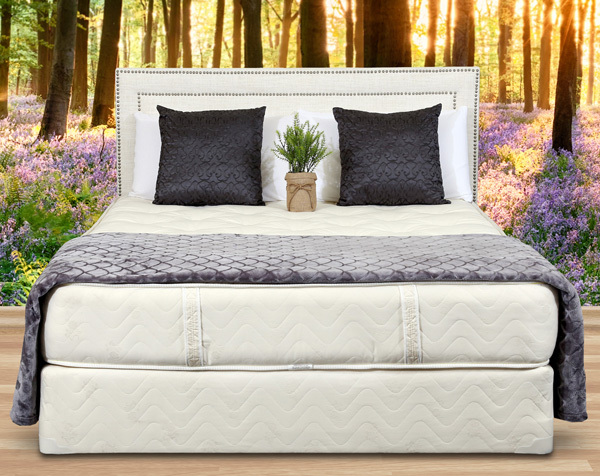 It is even possible to combine the manufacturing processes: the Talalay method is used to create a softer top layer for a mattress and the Dunlop method is used to create a strong base for a mattress. For the average consumer, it may be difficult to even feel the differences between Dunlop and Talalay mattresses if you have no previous knowledge about the manufacturing processes. Head to Gardner Mattress and speak with our knowledgeable sales staff; but most of all, try out both mattresses in our showroom. Contact us today to find out more. Next article Do You Really Need the Most Expensive Mattress?